Milky white Pyroceram squared glass bowl with sides tapering to a raised circular footring, handle moulded to one corner. At the beginning of this blog is the statement that a lot of these ramekins are coming onto the market as people pass away. Such is the case with these. I bought them from a man who does house clearances. These had been in someone’s kitchen for decades, still in the original box, untouched. They were most likely a wedding present back in the mid 1960s. They are marked with the words “Crown Pyrex” moulded into their base, along with a three-pointed crown symbol. Pyrex is a name for glassware introduced by the American Corning and Incorporated in 1915. Originally Pyrex was made from borosilicate glass. Their website tells the story that their scientists developed a heatproof glass for railway lanterns. Originally used in industrial applications, it became used as home ware when Bessie Littleton, wife of one of the Corning scientists asked him to bring home some glass to replace her broken casserole dish. He brought her the bottom of some battery jars. In the 1940s the composition was changed for some products to tempered soda lime glass that is now the most common form of glass used in glass bake ware and has a higher mechanical strength so is less vulnerable to breakage when dropped (the main cause of breakage in glass bake ware). Glass Ceramic materials share many properties with both glass and ceramics. They have an amorphous phase and one or more crystalline phases and are produced by a “controlled crystallization” in contrast to a spontaneous crystallization that is not usually wanted in glass manufacturing. Glass ceramics usually have between 30% [m/m] and 90% [m/m] crystallinity and yield an array of materials with interesting thermo-mechanical properties. For crystal growth to start, a primary process called nucleation has to occur. This is the focal centre around which the molecules can organize themselves. The secondary process of crystal growth follows nucleation. A nucleation agent is a foreign body added to create a new surface on which crystal growth can happen. Typically this phase takes the form of an agent to have a good match with the growing crystal. Established on the 25th of January 1939 and closing in 1982, Australian Consolidated Industries (ACI) was a holding company, consisting of subsidiaries that manufactured items such as bottles, glassware, sheet glass, engineering products and plastics. Located at Spotswood in Sydney, New South Wales, Australia, Brisbane, Queensland and Dandenong, Victoria. They had also opened a factory in Japan prior to the Second World War, and in Singapore, post war. Crown Crystal Glass Pty. Ltd. was established in 1926 when the Australian Glass Manufacturers Co. Ltd. acquired Crystal Glass Ltd. and combined it with one of their existing subsidiaries, the Crown Glass Company. The latter had been known as Crown Glass Works Ltd. prior to AGM acquiring it in 1921. AGM owned other subsidiaries throughout Australia & New Zealand, making bottles & jars and sheet glass for windows. Based in Sydney, Crown Crystal Glass would produce Grimwade hand-cut crystal, pressed glass tableware, and Agee Pyrex ovenware, the latter entering the market in 1932. 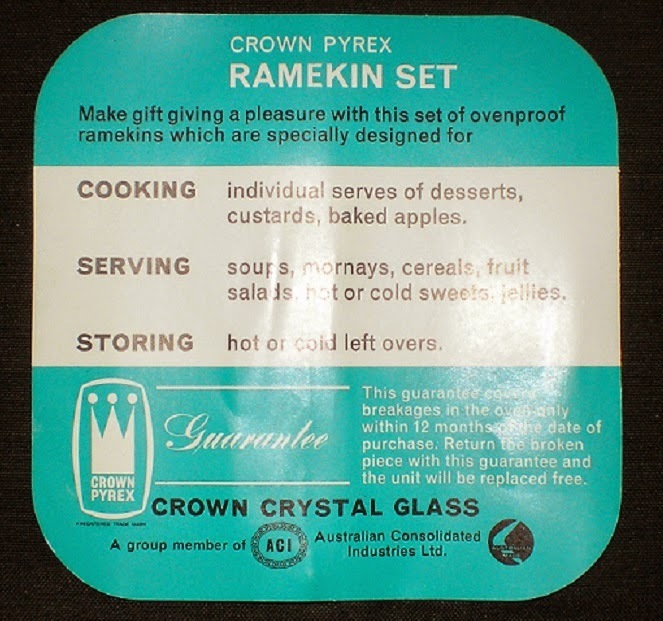 Although Pyrex had been made in England during the 1950s & 1960s and was marked with a crown symbol, the word "Crown" was never part of the brand name. Items with this logo are not meant to be "Crown Pyrex". A solid-coloured exterior finish first appeared on clear Agee Pyrex in 1938. Alongside ordinary clear Pyrex, colour choices available up to 1942 were: Blue, Green, Biscuit/Primrose, Daffodil. Biscuit and Primrose may or may not be the same colour; the descriptions in advertising vary. Only plain clear Pyrex was offered for the duration of the 1940s, but Biscuit, Blue and Green returned in 1950. Sometime during the 1950s, Coral (red) replaced Blue. In 1959 opal Pyrex could be purchased in Australia for the first time, but it was not made in Australia. British opal Pyrex from J. A. Jobling's was imported, starting with Daisy and Snowflake from the Gaiety product line. In white Daisy on turquoise, a shallow oval open baker was specially produced for a Nestle's condensed milk promotion in 1959. In place of JAJ's usual backstamp, "Nestle's" is embossed across the bottom. Clear Pyrex from England had always had a presence in Australia, and along with opal Pyrex, this was maintained until at least the 1980s, possibly later. The Australian plant launched opal Agee Pyrex in 1961 with the Festive Ware product line. Flannel Flowers, in Rose Pink, Haze Blue, or Buttercup, and Black Rose were the first patterns to debut. Solid-coloured Copperglow (or Honey Glow) and ramekins in Harlequin colours also appeared in 1961. Borrowing an American pattern from late 1961, Golden Pine was introduced in 1962. Other colours were a light sky-blue, pale dove–grey blue, (think Yves Saint Laurant) Eau De Nil Green, Summer Orange, Tangerine and Sun Yellow. Company names and brand names changed a few times during the lifetime of Australian-made Pyrex. Upon diversifying into plastics in 1939, the parent company, AGM, changed its name to "Australian Consolidated Industries Ltd." (ACI), and the glass-making division was named "Australian Glass Manufacturers Co. Pty. ", of which Crown Crystal Glass remained a subsidiary. Pyrex products marketed by Crown Crystal Glass had been consistently branded as "Agee Pyrex" until 1963 when the brand name transitioned to "Crown Agee Pyrex". A new logo was adopted at that time, a three-pointed crown. The Agee name was dropped eventually and the product was called "Crown Pyrex" and "Crown Ovenware" through the remainder of the 1960s and into the 1970s. Back stamps on some newer items simply state "Pyrex (TM) Ovenware" inside a circle, with no crown symbol. Up to the early 1970s Crown Crystal Glass had not been affiliated with Corning Glass Works of the United States. Corning already owned a subsidiary in Australia for processing and distributing Corning Ware, and in 1972 Crown Crystal Glass agreed to a merger with this division. Both ACI and Corning Glass held interests in the newly-formed company, which was named "Crown Corning Ltd."
Crown Corning kept the existing crown logo, and continued to manufacture Australian Pyrex along with Crown Crystal's other glassware lines. The Pyrex line remained throughout the 1970s, but it is unclear when it ceased production. Being part of Corning's international network, Crown Corning also distributed Pyrex Ware from the U.S., the U.K. and France to Australian consumers. There is now quite a bit of evidence that Crown Crystal was copying patterns from overseas after 1932. Copied patterns have confused collectors so be careful on Internet auction sites. In a case of what goes around comes around, Australian glass patterns are now also being copied, so be doubly careful. The inventor responsible for the discovery of this type opf glass, S Donald Stookey died on the 4th of November 2014 at the age of 99. See his entry on Wikipedia for more information, it is very interesting.